Would you use for quilting? Light purple, white, dark purple, what? How are you quilting it? machine, hand? How confident are you in your quilting skills? Do you want the quilting to be the focal point of this or a background embellishment? I think answering these questions will tell you what color to use. I will be hand quilting it. Would like for the centers of the blocks and the footballs to show the quilting. Since you want it to show I would use a medium purple, something just a shade or two darker than the material. In that case I would go with a light or medium purple. Dark purple may be too detracting and very often dark thread on a white has a tendency to take over. Especially in a solid as is the case in your quilt. I would audition a purple very close in value to the ring colors and maybe a shade lighter like a lilac. Your choice in batting will also impact how much the quilting will show. Something like Hobbs Polydown will give much more relief and shadow to the quilting (thus having it show more) as opposed to something very flat like Quilters Dream select or Hobbs 80/20. Medium purple would be my choice. I agree completely with Feline Fanatic. I'd probably go with a light or medium purple as well. Nicely done, btw. I'm drooling over that hand quilted red & white quilt underneath the DWR! I would go with light to medium purple, just a shade or two darker than the rings, although I've used variegated thread, which gives it a whole different dimension to the quilt. 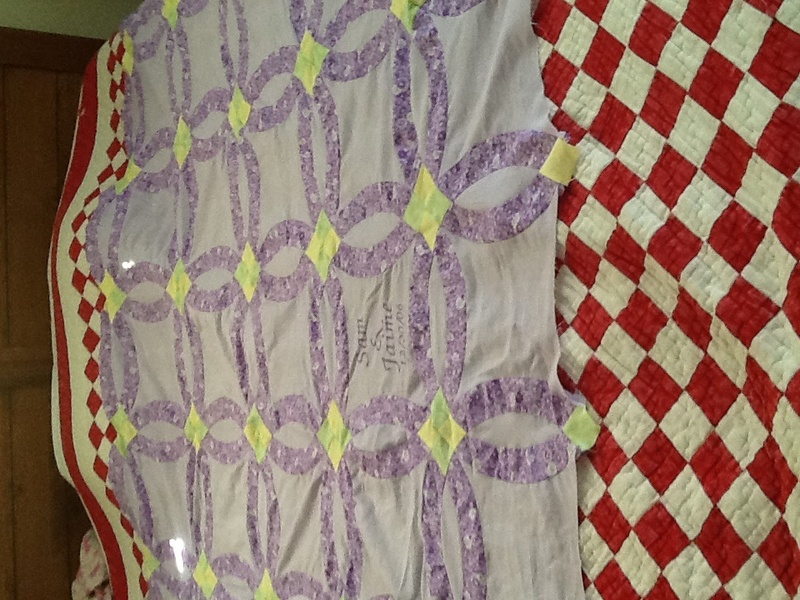 The quilt is very beautiful - love the violet. Is there a variegated with some lime green blending with the shades of purple? How adventurous are you? How adventurous are the recipients? Something to think about??? Good luck. It is lovely.